Looking for the right place to park? Be sure to check our parking map. From Houston: Take I-45 into Dallas. Take exit 286A towards I-35 E/Denton. 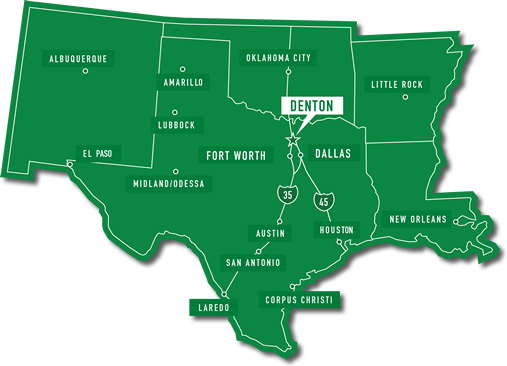 Proceed on I-35 and once in Denton, you will exit 466B/North Texas Blvd. From Austin/San Antonio: Take I-35 North into Dallas. Once in Denton, you will exit 466B/North Texas Blvd. From Fort Worth: Take I-35 W into Denton. When in Denton, take the I-35 E exit and proceed south. You will take exit 466B/North Texas Blvd. From Dallas: Take I-35 E North into Denton. Once in Denton, you will exit 466B/North Texas Blvd. From Oklahoma City: Take I-35 South into Denton. Exit 468 and proceed to North Texas Blvd.